Survey Results: How Do You Buy Books? Thanks so much to everyone who responded to the survey and answered the questions about how you buy books! It was so interesting and eye-opening to get a peek into your thought processes and book buying patterns. I hope you’ll find the results as helpful as I did. After I posted the questions, several friends told me about programs that would have made this much easier, had I known about them. Sadly, you’ll have to settle for my old-school process. Hope you don’t mind. Also, congrats to Lynne Kensington who won the free copy of Angel Falls! The overwhelming majority of you said you buy most, if not all, of your books online these days. Amazon is the number one retailer you buy from. Less than a third of you buy books anywhere else today. The top two answers were knowing the author and recommendations from others, followed closely by back cover copy. Interestingly, reviews trailed behind the other categories in terms of how you choose books. Most of you still prefer the smell and feel of a print book, but the convenience of e-books has many of you choosing both. For a handful of you, it didn’t matter, though most respondents had strong preferences either way. About a third of you always check the publisher. A handful never do. For those who said “sometimes” or “doesn’t matter” – the most common caveat was, “unless it’s a self-pubbed book.” Interesting. Q: If you like a book, what do you do? Based on the responses, you go all out in spreading the word about books you like. Almost everyone will recommend it; most will also review or give “stars” on Amazon or Goodreads. About half will promote it via social media. And you’re more likely to lend the book to friends than to buy them a copy. With the exception of those who don’t have e-readers and don’t download books, finding a new author via a free book will absolutely send you out to buy other books by that author. Q: How do you feel about book trailers? Book trailers don’t seem to influence most of you, one way or the other. You don’t love or hate them. Most of you said they have no impact on your buying decisions. But if you do watch them, you prefer movie-style over interview-style trailers—provided the acting is decent! Wow, what great responses! Thank you again for taking the time to give me your input. It’s given me a lot to think about in terms of how things are changing and where and how to spend marketing time and efforts. Hope you found it helpful, as well. By the way, if you’re feeling discouraged, check out my guest post on Seekerville called, “Four Reasons It’s Still Too Soon to Quit.” I’d love to know what you think. Interesting results! The response to book trailers has me thinking. Those can be expensive and time-consuming to make. If they don’t influence potential buyers that much, then they might not be worth the effort. Thanks for posting, Connie! I would be interested in the age of those who answered your poll. I’m finding that 50+ aren’t influenced much by video book trailers, but it is a whole different story for those under 30, especially teens and early 20’s. Hi Jennifer–I never thought to ask that question, but it’s a good one! I think you’re right. Age probably plays a big part in book trailer preferences. Connie – very interesting. Helps with knowing where/how to spend marketing time and dollars. This was very interesting, Connie. I’ve been pondering whether or not to try indie publisihing with my next book. Still on the fence. Hi Alison, I got the impression from reading the results that people had been burned reading a bad indie book, so they were still rather suspcious of anything without a known publisher name on the spine. As a writer, it can be tough to know which way to go. I hope you’ll let me know what you decide. Here’s my two cents Alison. I’ve been burned by indie authors too, BUT, if I know the author has previously published traditionally and they’re familiar with the editing process, I’ll read them. I agree, Sandra. The whole way we read and buy books is in transition! It’s been so cool to see and hear how people are thinking through the process and changing how they do things! Good to bear in mind for the future. Thank you. Great feedback! Thank you for compiling! I feel like readers book buying and reading habits are still in transition. We writers may be more open to the new ereader habit than other people our ages. However, I was surprised to find that my granddaughters, ages 11-18, still prefer hardback books. This is great insight! Thanks, Connie! Very interesting! Thanks for sharing, Connie. And for doing the survey. Thanks, Missy. I enjoyed it–and learned a bunch! The statistic I found most interesting was the respondents’ claim that they left stars or reviews for books they really liked. If that were true, then authors wouldn’t be stressing so much over getting reviews. I secretly like that book trailers weren’t too important because I have stayed away from learning how to make them. Thank you for your time in compiling and sharing the information. Thanks so much for sharing these results, Connie. I don’t think most of the answers were that much of a surprise – except for book trailers. I love making these, but they are, as someone else said, extremely labour intensive and time consuming to do oneself, and expensive if you get someone else to make them, so it appears they may not be worth the effort for readers of my own agegroup. I’ll probably continue to make them though, as i do like to try all avenues and options! As for self published books, I’ve heard a lot of people say some authors just put books out there without due attention to editing, and formatting. I only have one self pubbed book myself, and that was previously published. I don’t think I have the confidence to selfpub without the ‘stamp of approval’ of a publisher first, although I know many authors who were traditionally published and then turned to self publishing, and their books are excellent, so it’s just a pity that self pubbing is getting a bad name from those who don’t know enough about the process, or can’t be bothered to do the groundwork first. I’ve heard the same comments about about self-pubbed books: people have been burned buying books that weren’t “ready”–weren’t written or edited well, and that makes readers leery to plunk down money the next time. Interesting survey, Connie. I’m wondering how many responded to your survey. Also, I’m thinking that the readers who would fill out an on-line survey are probably more comfortable with e-books than some of the more traditional book in their hands readers. That’s those who say they get their grandchildren to check stuff out on line for them. 🙂 But I did enjoy reading through the responses you got. 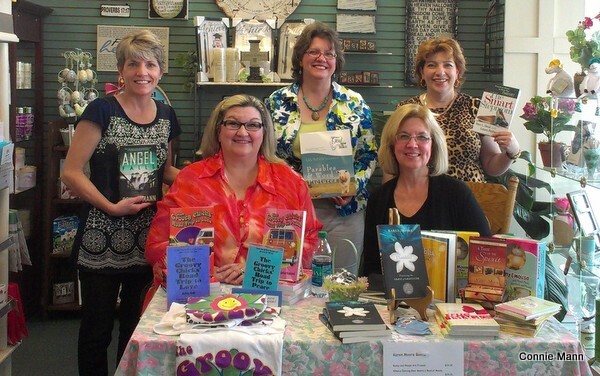 As always, word of mouth seemed to be the best way for a writer to find new readers. All we have to do is get people telling their friends about our books – telling good things anyway. I’m with you, Ann. That was the thing I realized–no matter what, word of mouth is still the best way for a writer to find readers!! Appreciate you input! Thanks for posting your survey results…..interesting. I didn’t realize the high percentage of online ONLY purchases. I love to buy in bookstores when possible. I haven’t seen many trailers, but yours was lovely. I think more of my purchases will be influenced by trailers. Authors have plenty to do with ALL the promoting…plus their writing! That surprised me, too, since I shop both online and in bookstores. I’m so glad you enjoyed the trailer! I am blessed with a son who works in the movie industry, so I had a pro to do mine! Interesting results, Connie. Thanks for your efforts. I’m sorry a lot of people don’t give self-pubbed books a chance, though. I self-pubbed mostly because I enjoyed the challenge of doing everything myself, but I did hire an excellent editor. No book should be pubbed without a professional edit. Fortunately, I have many personal contacts, and I’m selling a lot of autographed copies myself. My sales have dropped during the past two months, though, because my granddaughter was very ill and went home to be with the Lord on April 23. So, I’ve done no marketing for some time, but eventually I’ll get back into it. Would appreciate your prayers. That breaks my heart to hear!!! Yes, prayers definitely going up for you and all of your family!!! Please let me know if there’s some way I can encourage you. I think lack of editing is most people’s complaint about self-pubbed books. Glad you have an excellent editor to work with. And here’s hoping you’ll regain your momentum–after you’ve taken some time to heal. Thanks for letting me know. Hugs to you and your family.. I happened upon your website and found it very interesting. I am a member of the Women Into Lifelong Learning group. We have a very active book group. I do not know where you live, however, we are in Ormond Beach, Florida. I was wondering if you would be interested in speaking to our group at some point in time? If so, do you charge a fee? We have about 80 members in the entire group and I think your could be very inspiring.